I had to laugh about the high volume distributor! Basically, I’m a home roaster and I take coffee seriously. That said, I discovered your brewer from a story I read on the Ineedcoffee blog. They were pretty impressed with your brewer so I gave it a shot. Changed my life it did. I’ve tried the Areopress, French Press, Clever Coffee Dripper, Ibrix, and a number of different pour over systems. Then I met your. Quick, Easy, Adaptable. Sold! Now, I’m telling my friends and family that enjoy my coffee to get your brewer. I have one for home and in my travel gear. Simply, it’s one of the best systems I’ve used. It proves itself every day. I did make what I think is a slight assist to even better coffee. It even keeps with the cowboy theme of the brewer! I took a piece of 550 paracord, needle and thread, and made a little Cowboy Joe Lasso that uses the hole in the handle of the dripper, a small knot and then a sewed hondo around the plug’s handle. Never lost that way and stays connected in the dishwasher. I might have a photo taken and I’ll email it. Yup, just took a look at my photos and there’s a pretty clear image there. It will follow this email. I’m a school teacher so I’ll tell you up front it won’t hurt my feelings if you don’t need advice. Goodness knows that teaching high school students has built up that skill set in me. You have an excellent product. Using only Paypal is the reason I bought two more for family who don’t have an account with them set up. Not sure if you qualify, but I have a feeling that getting your product on Amazon.com might be a money maker…again, feel free to ignore. Simple, easy to travel with, easy to clean, makes great coffee. I have a lot of coffee makers, but this is a game changer. 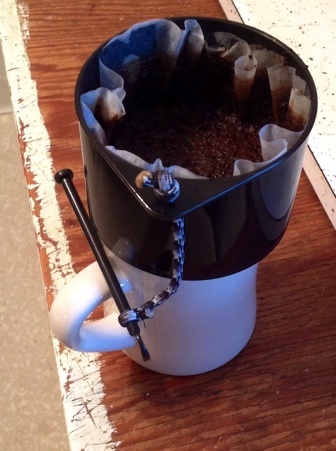 Mix a French press with dripper, utilize an inexpensive basket filters or #4 cone...you have the Cowboy Joe. How do i make coffee: Simply place the drain plug, drop in a filter, add coffee (I use 22 grams, but I like full bodied flavor) pour in 50-75 grams of 200 degree water for a 30 second bloom, add water to reach 310 grams (about 10 ounces), let it brew for 3:30, pull the plug to drain into a cup, toss the filter and drink. I've been a coffee drinker for a long time, and now I am transitioning into being a coffee connoisseur. I've tried the Aeropress, which was a fun system to learn with. A little messy and time consuming, but still better coffee than anything I could buy from places like Starbucks. The Cowboy Joe was given to my by a good friend to try out. My Aeropress is now gathering dust because of this system. Simple to use, easy to clean, and one of the best gifts I've ever been given. I cannot recommend this system enough. If you really want to enjoy coffee, then buy this system. strength. Seems a little pricey for a plastic gizmo, but it's the concept, the invention, which matters. Easy clean-up. I USE MY "COWBOY JOE" EVERY DAY....PERFECT COFFEE EVERY TIME....AWESOME EASY CLEAN-UP .....LIFE IS NOW GOOD!